Check some things off your list right now by buying online or calling our box office. We make it easy! But – most importantly – show tickets are a thoughtful and personal gift. Lightwire Theater’s Dino-Light is a glow-in-the-dark adventure that blends puppetry, technology and dance. Our young professionals program, TodayTix Center Social, combines discounts, cast meet-and-greets, networking nights and more. This one gift provides a whole year of events. Click here to check out the fun we’ve already been having! Our Elevator Project series features Dallas-based groups that you might not have heard of yet – often in unique spaces on our campus. This season includes theatre, dance (modern, ethnic and traditional), music (from Flamenco to Afrobeat), a Bacchanalia, and more. All tickets are $25 each! Formerly known as A Prairie Home Companion, see Live from Here with Chris Thile … live! 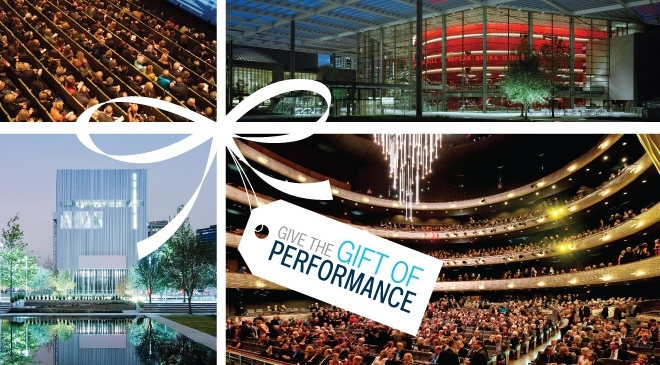 This variety show features music, comedy, and audience interaction – this time in the Winspear Opera House. Joan Baez, the legendary singer/songwriter/activist, will stop in Dallas on her Fare Thee Well… Tour. Sarah Brightman is the world’s most successful and best-selling soprano, also known for her iconic star turn in The Phantom of the Opera. We have gift certificates, in any dollar amount!